Fifth Street Also known as the “river” card. In flop games, this represents the fifth community card on the table and the final round of betting. In Stud games, this is the fifth card dealt to each player and represents the third round of betting. Five-card Draw A poker game in which the player is dealt five cards down. They have one draw to replace them and the best high hand wins the pot. Five-card Stud A poker game in which each player is dealt five cards, one down and four up, with betting after 2, 3, 4, & 5 cards. Flat Call Calling a bet without raising. Flop In Hold'em and Omaha, the first three community cards that are dealt face-up in the center of the table all at one time. The “flop” also indicates the second round of betting. Flop Games Poker games (Hold 'em and Omaha) that are played using community cards that are dealt face up in the center of the table. Floorman An employee of the cardroom who makes rulings and decisions. Flush Any five cards of the same suit. Flush Draw When a player has four cards in his hand of the same suit and is hoping to draw a fifth to make a flush. Fold To throw your hand away when it's your turn to act. Forced Bet A required bet that starts the action on the first round of a poker hand. Four of a Kind Four cards of the same number or face value (“quads”). 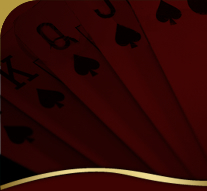 Fourth Street In flop games, it is the fourth community card dealt (also known as “the turn”) and represents the third round of betting. In Stud games, it is the fourth card dealt to each player and represents the second round of betting. Full House Any three cards of the same number or face value.